Give a man a Murloc, and he'll eat for a day. Give him a Murloc Knight, and people will hate him. In a dragon deck I'd say its a better card than a faery dragon, even though it is itself not a dragon. I don't think its enough to make dragon warrior better than patron/control warrior. nice card... things keep getting better. Isn't fiery war axe already 3 attack with charge? Vision without action is a dream. Action without vision is a nightmare. I appreciate that the card makes direct reference to Alex, given how prevalent she is in Control Warrior. Beyond that, however, this doesn't really fit in any given Warrior archetype. Perhaps midrange Dragon Warrior will become a thing in TGT, but right now this card doesn't really fit. Control Dragon Warrior already exists, and it doesn't need more early removal. In arena this card will be a good buff for Warriors. Right now they have no consistent rares, and the potential for a 3/3 with Charge on turn 2 will be very good, and a 2/3 is still acceptable. WOOT?? 3/3 charge for 2 mana? This card is the most insane of all reveales so far...OMG is this card good! This makes me wonder if they're going to reveal more dragons. "The Empire I remember never surrendered"
Well-balanced, pushes a new archetype... I can dig it. Building Quirky Decks Every Week, Loving Life at Rank 15! 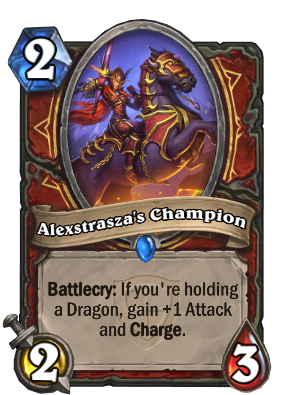 This is very much what dragon deck needs...so yup Dragon Warrior confirmed. This card is gorgeous and the potential for 3/3 charge so early seems pretty powerful. Like it.